A bottlenose dolphin captured last month off western Japan has an extra set of fins, providing further evidence that ocean-dwelling mammals once had four legs and lived on land, Japanese researchers said Sunday. Fishermen netted the four-finned dolphin off the coast of Wakayama prefecture (state) on Oct. 28, and alerted the nearby Taiji Whaling Museum, according to museum director Katsuki Hayashi. The second set of fins — much smaller than the dolphin's front fins — are about the size of adult human hands and protrude from near the tail on the dolphin's underside. The dolphin is 8.92 feet long and is about 5 years old, according to the museum. Although dolphins and whales with odd-shaped protrusions near their tails have been caught in the past, researchers think this is the first one found with well-developed, symmetrical fins, Hayashi said. "I believe the fins may be remains from the time when dolphins' ancient ancestors lived on land ... this is an unprecedented discovery," said Seiji Osumi, an adviser at Tokyo's Institute of Cetacean Research, at a news conference televised Sunday. Hayashi said he couldn't tell from watching the dolphin swim in a museum tank whether it uses its back fins to maneuver. Fossil remains indicate that dolphins and whales were four-footed land animals about 50 million years ago and share common ancestors with the hippopotamus and deer. Scientists believe they later transitioned to an aquatic lifestyle and lost their hind limbs. Whales and dolphin fetuses show signs of hind protrusions but they disappear before birth. A freak mutation may have caused the ancient trait to reassert itself, Osumi said. 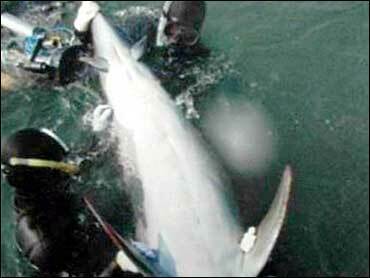 The dolphin will be kept at the Taiji museum to undergo X-ray and DNA tests, according to Hayashi.